autumnal › Buy Poster of Autumn still life. 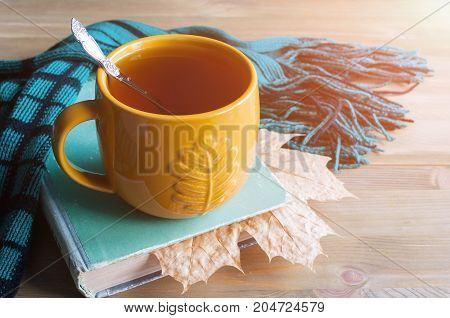 Cup of tea, worn book with dry maple autumn leaf, green scarf on the wooden background - autumn still life. Autumn background. Autumn concept. Vintage autumn still life. Autumn composition. Poster of Autumn still life. Cup of tea, worn book with dry maple autumn leaf, green scarf on the wooden background - autumn still life. Autumn background. Autumn concept. Vintage autumn still life. Autumn composition.